Flower: White, Pale Yellow - Pale Orange. Synonyms: Convolvulus obscurus Carl Linnaeus 1762. Ipomoea luteola R. Br. 1810. Ipomoea insuavis Blume 1825. Convolvulus ochraceus Lindl. 1826. Convolvulus pilosus R. Br. 1826. Convolvulus trichocalyx Schumach. & Thonn. 1827. 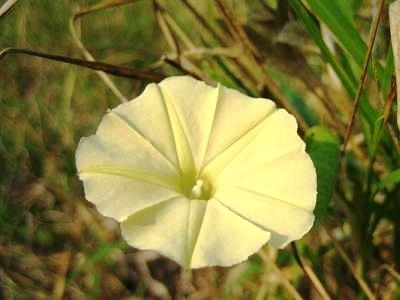 Ipomoea ochracea (Lindl.) G. Don 1837. Ipomoea fragilis Choisy 1845. Ipomoea kentrocarpa Hochst. ex A. Rich. 1851. Ipomoea demissa Hallier f. 1893. 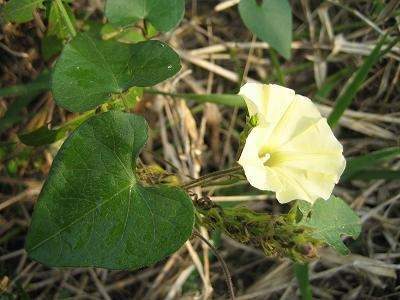 This member of the Convolvulaceae family was given this name by John Bellenden Ker Gawler in 1817. It is found around the tropical part of the world except the Americas, growing in a well drained soil with some water and lots of sun. The vines will grow up to three meters, the flowers are pale yellow or pale orange.